Black Friday shopping is an insane undertaking for those of you who braved the crowds, did you by any chance manage to get your hands on a brand new Kobo eReader? Don’t miss out on another chance to save, by using this offer from Kobo: for a limited time, you can save 30% off a wide selection of titles for your nifty new gadget. 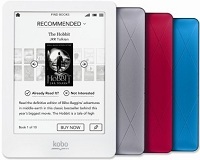 Don’t forget to bookmark our Kobo coupon page to continue saving in the future. It’s no secret that I love my Kobo eReader and since I make constantreferences to my adoration for it and take every chance I get to show it off to others. It definitely a nifty gadget that has made my daily commute go by so much faster. From fantasy to horror and even romance to 50 Shades of Grey–that truly does fit in its own category–there really is a book for everyone. I dare you to find one that you wouldn’t want to dive head first into. Do you have an eReader of your own? How much do you love it? Let me know! After all, eReaders are a great way to reduce the cost of reading.